After seeing Helen Frankenthaler’s Mountains and Sea in her New York studio in 1953, Morris Louis described the revelatory moment claiming that Frankenthaler was “a bridge between Pollock and what was possible.” Louis and Noland eagerly returned to D.C. to try out Frankenthaler’s stain technique for themselves. This resulted in what Noland called “jam painting,” inspired by the collaborative sessions of jazz musicians. To achieve an ideal pure color, the two artists thinned acrylic pigments and poured them onto the same canvas, working together in the studio to manipulate the paint to become near-transparent. After “jamming” this way for a couple of weeks, they returned to their respective work and carved out their individual styles. Morris would become known for his veils series of 1954 and his floral series later in the decade. Noland worked through a variety of themes throughout his career, namely the target and chevron images. On display from the Kenneth Noland Art and Artist Files is an invitation to the event Noland Returns held at Catholic University in 2014. 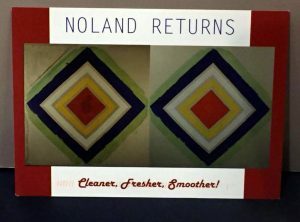 Noland had been a professor at Catholic University from 1951-1960, and this event celebrated the return of Noland’s Pool, a six foot magna paint on canvas painting which had undergone intensive restoration due to damages caused by a fire in the University’s Department of Art. 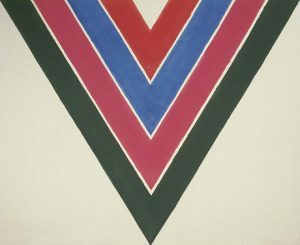 This early work exemplifies Noland’s use of geometric shapes, often coaxial circles, but here using layers of colorful squares. In 1952, Gene Davis was approached by Noland to host a show at Catholic University after the success of his one-man show exhibiting expressionist drawings at the Dupont Theater Gallery. Unlike the majority of painters belonging to the Washington Color School, Davis had no prior training when he began working, having spent his career as a journalist. Through most of the 1950s, Davis’ art was experimental and it was not until 1959 that he first completed his stripe paintings on raw canvas. 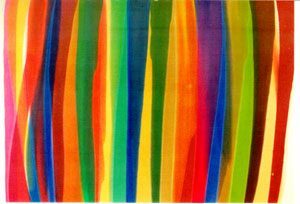 For him, the stripe served as a vehicle for enclosing color, allowing the viewer to enter color through a single stripe. 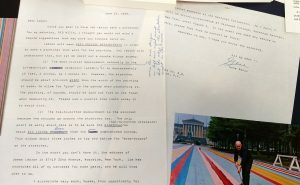 A particularly interesting document in the AA/PG Library collection is a signed, edited letter by Davis from 1969 in which he outlines methods to have a stretcher made for his painting Red Witch to be displayed at the National Collection of Fine Arts, now the Smithsonian American Art Museum. 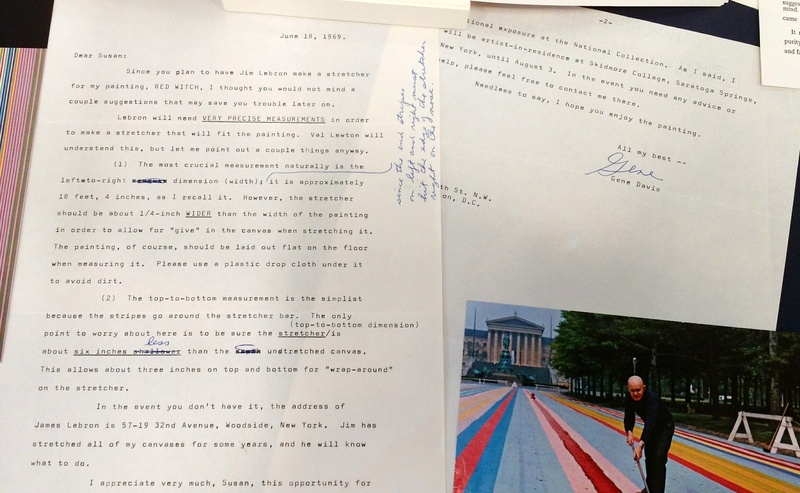 The letter, with its scratched out words and inserted comments, provides insight into the artist’s pride, precautions and appreciation for exposure as his painting is transported from one institution to another. Red Witch will be displayed in the Smithsonian American Art Museum’s exhibition Hot Beat: Gene Davis opening on November 18, 2016. The AA/PG Library’s across-the-hall neighbors, the Archives of American Art, also holds the Morris Louis and Morris Louis Estate Papers and the Gene Davis Papers which contain personal documents of the artists as well as interviews with Davis and other artists of the Washington Color School. 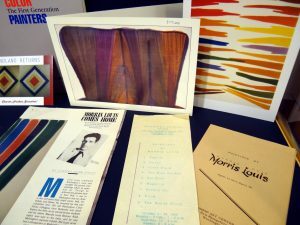 The AA/PG Library exhibition will remain on display until spring 2017. HARD-EDGED, BRIGHT COLOR: THE WASHINGTON COLOR SCHOOL. HARD-EDGED, BRIGHT COLOR: GENERATIONS OF COLOR. HARD-EDGED, BRIGHT COLOR: BEYOND THE END. —“Hard-Edged, Bright Color” was produced by Angelique Roy, with assistance from Anne Evenhaugen. Roy was the 2016 ARLIS/NA Wolfgang Freitag Internship Award recipient, and completed her internship at the Smithsonian American Art and Portrait Gallery Library.